Charlie's older sister is getting married and the whole family will be under one roof for the weekend. Charlie is the youngest and there is nothing she loves more than having all her siblings at home. She's going off to college in the fall and this may be the last chance for a big Grant family weekend. And what a big weekend it is. Not only is her sister getting married, but the whole family is being featured on Good Morning America. Charlie's mother is the artist behind the very popular comic strip Grant Central Station and it is ending its successful run this weekend. As with most family reunions, there are plenty of laughs as well as a few frayed nerves and some tears. Everything seems to be going wrong for the wedding and Charlie steps in to save the day. I think at first it might have been Charlie's choice, but as things continue to fall apart it seems that the family relies overly much on this high school senior. 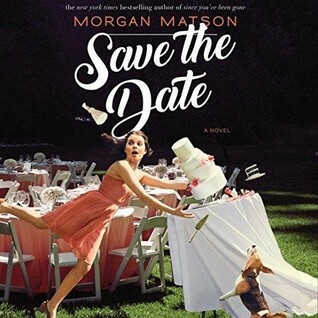 Save the Date is a heart-warming story about growing up and what it means to be family. If you have a teen struggling with changes that are occurring in their life, then maybe they can learn along with Charlie that while some things change, the really important things, like the love of family, remains the same. The audiobook was well done and the story was easy to follow with a divided attention. It is one of the longer audiobooks that I've listened to in a while, but it felt like the story went by quickly. It sounds to me like Save the Date would be exactly what I want from a wedding book or one with changing family circumstances. I do get distracted from audiobooks easily, so it's nice to know that it will probably hold my interest.